When Peter Holloway opened the Boulevard Steakhouse in 1998, he brought with him a heritage steeped in the restaurant business. While in college, he worked at the Hungry Peddler and discovered he loved the service business and taking care of guests. He earned a degree in psychology but “fell in love with insanity” along the way, choosing to remain in the food industry. Over time Holloway, bought Boulevard Steakhouse piecemeal. Now he owns the whole block and can provide a venue for five separate events simultaneously: Martini Lounge, Wine Room, Cellar Room, Board Room and the Diamond Room. The Martini Lounge complements the overall dining experience and offers a Happy Hour, complete with hors d’hoeuvres, Thursday and Friday 4:30-6:30 p.m. and live entertainment Friday and Saturday nights. All the areas of the Boulevard Steakhouse intertwine with each other. If the Holloways had known they were going to own the entire facility they “would’ve done things differently; wouldn’t have put a steakhouse in the center,” according to Holloway. Upon entering, the heavy wooden bar beckons. The mirrored backdrop reflects the crushed velvet upholstered booths in the background and the chandeliers project just the right amount of light. The ambience conjures up visions of The Rat Pack with drink in hand and laughter. Good times. Only a savvy restaurateur like Holloway could capitalize on quiet Sunday evenings by hosting Dinner Club the first Sunday of every month. The evening features a four-course meal and specially-chosen wine. “The meal is always based around steak; the steak is the centerplate item. There is always a theme, and the Dinner Club is centered on educating people about wines,” Holloway said. 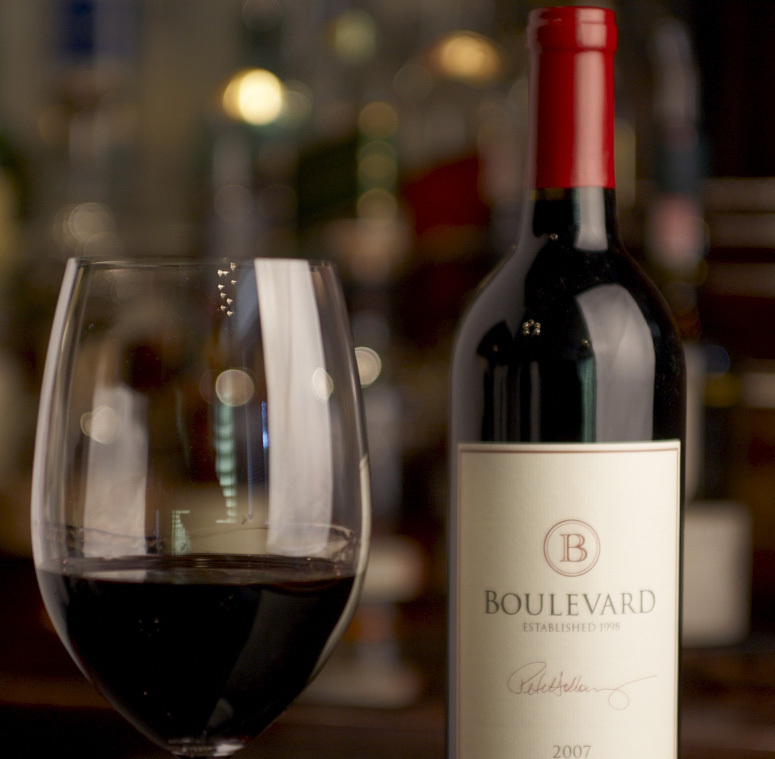 The steakhouse has 700 wines on their list including their very own Cabernet. “The wines enhance the experience,” Holloway said. The wine, varied each month to complement the meal, comes with a wine lesson. Chef Jimmy Stepney creates a four course meal paired with a featured wine. “I enjoy doing these [Dinner Club], putting the menu together,” Chef Jimmy Stepney said. May’s Dinner Club menu, for instance, included a Roasted Peach Salad, Chicken Roulade and Prime Center Cut Filet and Apricot Mascarpone Gateau. Each course was accompanied by a Milbrandt Riesling, Chardonnay and Cabernet wine. Reservations are required to participate in the Sunday Dinner Club. Boulevard Steakhouse is known for their 7 oz. tenderloin filets and fresh seafood. And what does the guy in the know order? Holloway enjoys the steaks, seafood dishes or the Chef’s creation. “I’m more of a grazer than anything,” he said. The old world charm will draw you in; the great food will hook you. Sinatra spoken here. Says so on the door. Welcome. Hours are Monday-Thursday, 5:30-10 p.m.; Friday and Saturday, 5:30-11 p.m. and Sunday, 5:30-9 p.m . Located at 505 S. Blvd. Edmond, call 715-2333 for reservations.